It is widely recognised that employment has a wide range of benefits including enhanced physical and mental wellbeing. 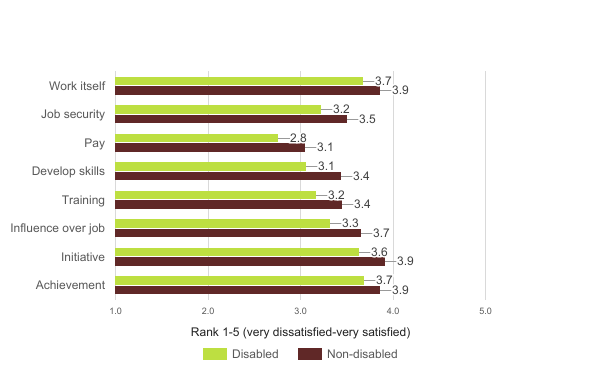 Research using the Workplace Employment Relations Survey (WERS) 2004 and 2011 finds significant gaps in reported wellbeing at work between disabled and non-disabled employees as measured by anxiety-contentment, perceptions of fairness of managers and job satisfaction. These gaps are evident even among otherwise similar workers in similar jobs. We believe these gaps provide a useful and encompassing indicator of disability disadvantage (Jones and Wass 2012) and that analysis of them over time will provide a key indicator of whether disability disadvantage is increasing or decreasing. Our research also suggests that different organisational policies, practices and forms of support can be important in narrowing disability wellbeing gaps (Jones 2016, Hoque et al 2016). Particularly pertinent for policy and practice is whether such gaps should in future be more closely monitored, and whether measures of such gaps could be used by organisations to evaluate the impact of workplace change on disabled employees. Jones, M., Mavromaras, K., Sloane, P. and Wei, Z. (2014) Disability, job mismatch, earnings and job satisfaction in Australia, Cambridge Journal of Economics, 38(5), p.1221-1246.